FIND OUT WHERE OUR VISITORS STAY! St Petersburg Hotel Recommendations is our guide to the most popular hotels in Russia's Northern Capital according to our visitors and readers. For most of us choosing where to stay when we travel is a balance of budget, location and facilities, Right? But with the enormous number of promotions, deals and programs out there, searching can be overwhelming and time consuming. For this reason time ago I've created a comprehensive guide to the best St Petersburg hotels to help travelers like you finding a good place to stay. However, I came to the conclusion that it was not enough, so recently I went the extra mile (for you, my reader), and I made a new up to snuff list of the most booked hotels according to the first- hand experience of our readers and past visitors. I did reach out to our previous guests, specifically those who contacted us in the past years through our website, and I did ask each one of them where they stayed during their Russian vacation; why they have chosen to stay there; and, if they would recommend that hotel to any of their friends. Well, to my surprise many people have replied, while some they haven't! 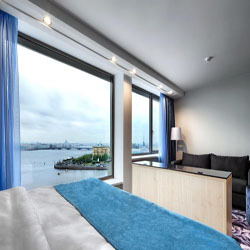 But at the end, I've managed to gather and analyze a lot of real data which allow me to put together what I call the creme de la creme of hotels in St Petersburg Russia. All the hotels listed here are featuring great facilities, interior décor, and service. And in addition to that, they are also centrally located so with a short and easy walk from some of the Top Attractions or the best Russian Restaurants, including bars, shops, clubs, and cafes. Check out below our list of the 10 most popular hotels in the city, and find your perfect room. Happy Booking! If so, search for your ideal Hotel on Booking.com. Read reviews from different travelers, see photos, and get the best price online. And, if you are looking for the last hot deals, then go one click further by taking a look below.